This post was promised last week…so I’m hoping that Sunday still counts because as per usual life has gotten in the way and what should have been easy to do took me forever. I love making handmade gifts but am not a crafter or a DIYer so in place of glitter, mason jars and twine I go with good old chocolate for making gifts for those people who can be a little awkward or tricky to buy for. This fudge I came up with last year and then made recently for our #brunchclub goodie bags, and it seemed to go down a treat! 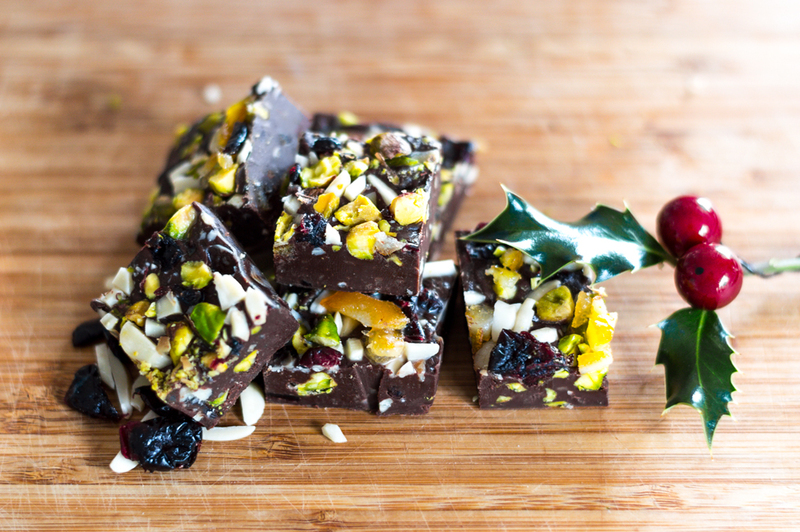 It uses my pretty standard chocolate fudge recipe and throws in some extra bits and pieces to bring in the festivity. 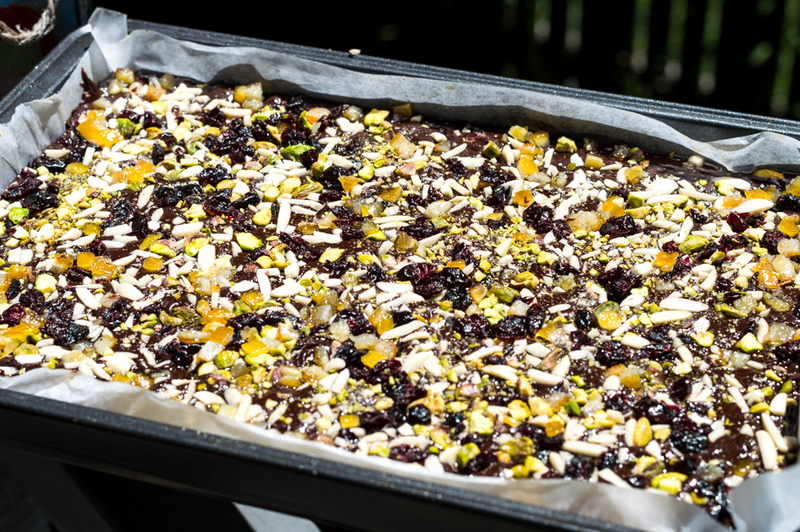 Along with the rich dark chocolate and sweet condensed milk I add some nuts (what ever is handy but my current favourite combo is almonds and pistachios) as well as some dried cranberries and some dried ginger/candied peel stuff that I found and that looked mildly appropriate. 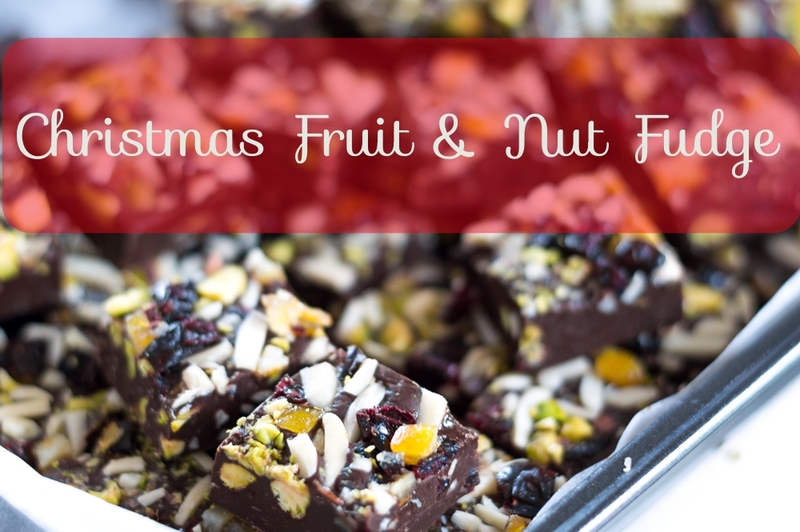 The result are rich little morsels of smooth chocolate, crunchy nuts and chewy fruit. The overall objective: Christmas in every mouthful. Put the butter, condensed milk, vanilla essence and chocolate all into a saucepan on a low heat. I put the chocolate in last and keep this pretty low in temperature as chocolate can be one fussy ingredient and the fear of it seizing on me makes me unusually cautious. Not cautious enough to use a double boiler, which you can totally do. Im cautious but also lazy I guess this indicates. Wait for this to all melt but stir it until your arm hates you. Or get someone who loves you to stir it. It needs pretty consistent stirring, again so that the chocolate doesn’t turn on you and ruin a perfectly delicious gift idea. 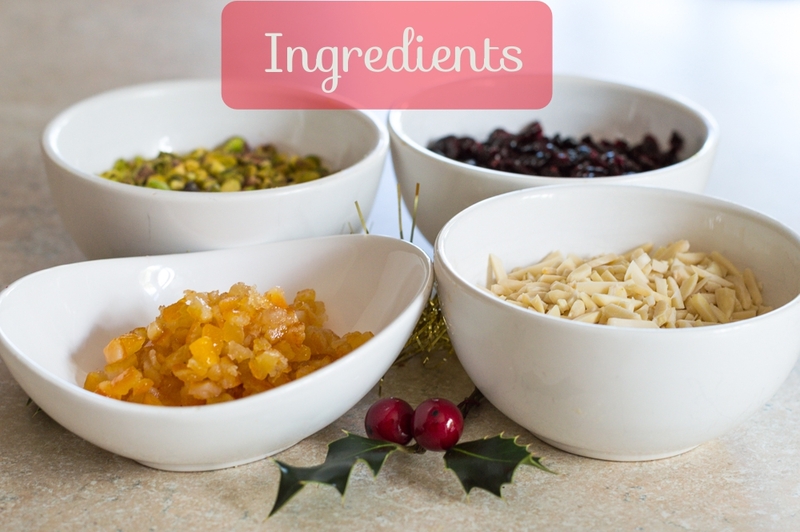 Once everything is smooth and combined, take the mixture off the heat and throw in half of all your delicious extras (as in half a cup of each nut, 1/2 cup cranberries and 1/4 cup of the candied mix). Mix this all through then pour into a lined baking tray. Smooth the whole thing down with a spatula (not too smooth ’cause rustic is totally what we are going for) and then sprinkle the rest of your extras over the top, attempting to be even but in the end, this is an unrealistic expectation to set upon yourself so just go wild. Press this all down gently otherwise all this good stuff will go rampant when we cut it up and bag it. Set in the fridge for as long as you can, at least a few hours then take it out and slice it! 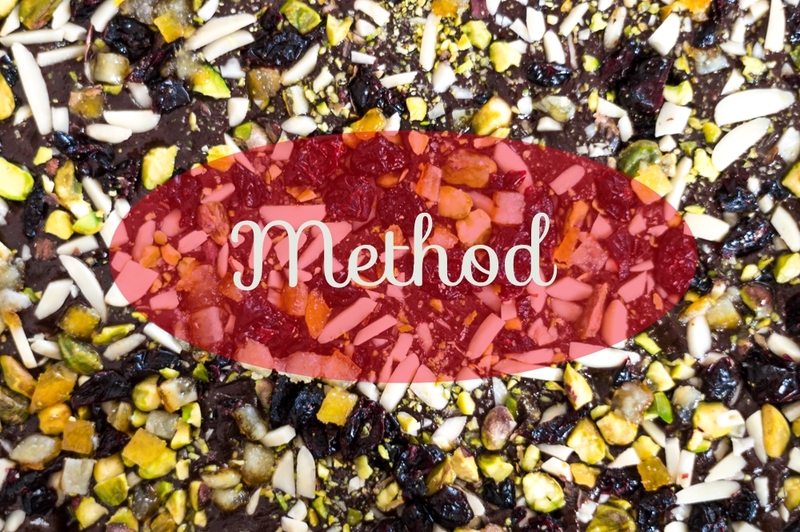 Tips – If the mixture with the chocolate starts to get too thick or its not smooth enough add a little liquid. I use baileys (because I love to add this to everything) but you could just use a little cream. Being Lizzy, I forgot to take a shot of these all bagged up with Christmas ribbons, but a recipe post wouldn’t be complete without me forgetting a step. You can buy little resealable bags from places like Looksharp, which make life a lot easier. I then added some twine and ribbon to make them worthy of all the lovely bloggers but you could just eat it all with the purpose of saving all your friends and family the calories. The great thing about this fudge is that you can totally change it up as much as you want. 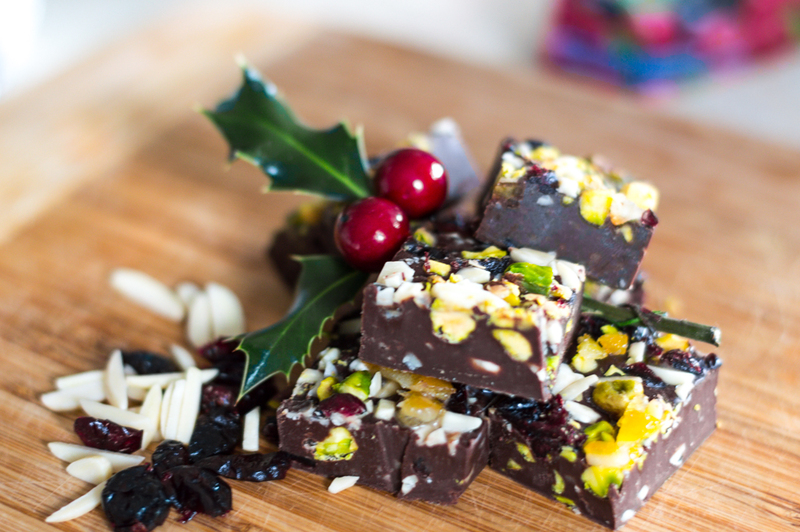 You can go with white chocolate, macadamias and cranberries (this actually sounds like a good idea for my next fudge post…), chocolate and coffee liqueur with hazelnuts, peppermint chocolate (just add a small amount of peppermint essence and voila!). The opportunities are almost endless! 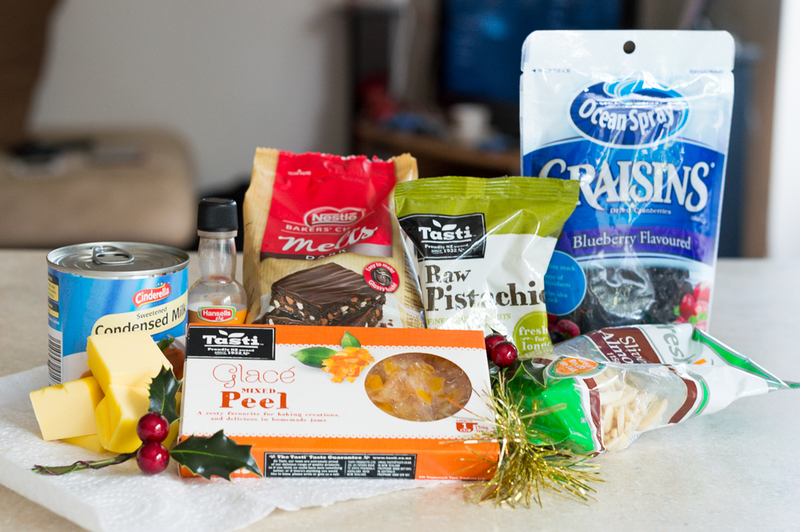 Let me know if you end up making this or if you have any other amazing fudge recipes to share! 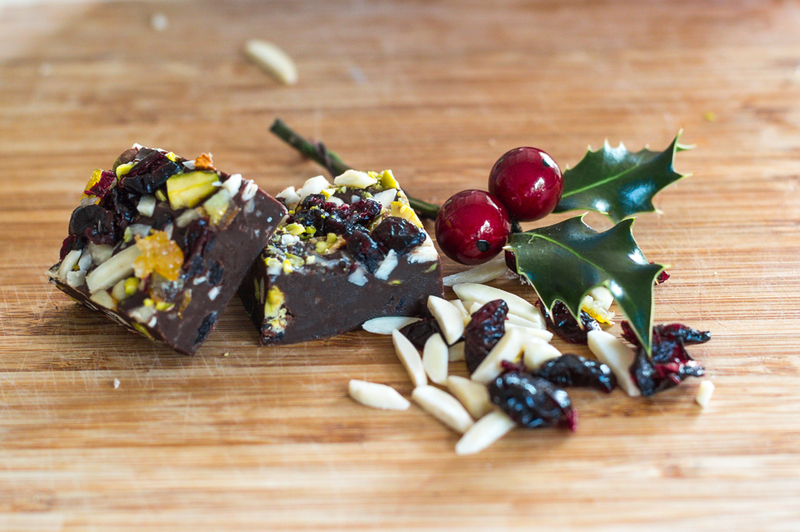 “1 cup slivered almonds that you have tried to hack into smaller pieces but in reality have just turned into a giant mess” – Lizzy, not only do you produce the best ever fudge recipes, but the most hilarious (and realistic) instructions, as well. This was another winner and I am *totally* getting down with some fudge making this silly season! Amazing. <3 You are so so fantastically marvelous at baking.